Telemarketers – the masses fight back! My story starts with a string of missed calls seen on my cell phone from a 866 897-2756, a telephone – a E tour and Travelnumber. After I realized that they weren’t going to stop calling me I intercepted one such call and politely asked the gentleman on the other side to PLEASE take me off their do not call list. Several days later they called again, and I asked why they are still calling. My number it seems has been in the system since 1997 and belonged to someone else and wow, since the guy who’s number it was previously is not around they are very kindly going to extend this Deal of the Century to me! Some convoluted story regarding a Orlando vacation and $99 per person for a 5 say holiday and a rental car and free plane tickets. Next follows what I can only describe as the worst, rudest customer service experience I have ever experienced. I ask to speak to a supervisor and come up with an excuse – they hang up on me. Call again, supervisor – well I’m a supervisor says one female rep, “What’s your name , Cristal she says, “Last name I ask” sorry sir I don’t feel comfortable giving it out to you” WTF!! Third call ends in someone hanging up on me too! All in all I was hung up on 5 times!!! They keep calling daily even though we have told them we are not interested in traveling due to poor health. One guy got very, very rude and sarcastic and just plain hateful. I am on line with them and they say that my husband and I have over a 900 dollar trip we never took back in 97. I told them I don’t do time share. But they would not hang up and let me call my husband. <<< similar to the 1997 story they gave me! eTour and Travel is the name of the company. Website is http://www.etourandtravel.com/. They sell trips to their resorts and on these trips you have to sit through a siminar or something for 2 hours about their resorts. It’s almost like a time share but not quite. I have a problem with them calling me every month to offer me something and I have told them time and time again that I want off their calling list….but they still wont take me off. It has gotten to the point where I am now reporting them to the BBB every time I request this. 3 pages of complaints here! and more here. They you can use the nice folks at the better business Bureau to get the full skinny on them Full Details can be found here. Long history of Complaints …. This company is owned and controlled by the Kosmas Group and Cape Canaveral Tour & Travel. The Bureau has known both companies from similar operations that have been the subject of consumer complaints. From the info below it appear that we should all be talking to Mr Lance Croft and congratulating him on his piss poor service and rude employees. kyped this number – got an announcer with some woman with a Northern British sounding accent. The number is for “ETour and Travel” (etourandtravel.com) which gives an alternate contact number of 1-800-339-5114. Their website also has inbound toll-free numbers: Orlando, FL 866-912-9286; Hollywood, FL 866-836-3855; Kissimmee, FL 866-311-2562; Largo, FL 866-639-7720; Non-toll-free: 407-658-1768 and 407-515-2400. 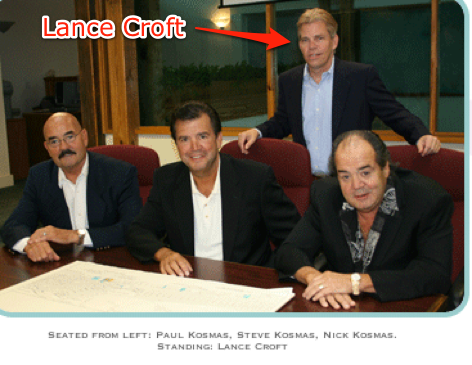 This “Lance Croft” also has domain names kosmasgroup.com and kgiresorts.com (identical WHOIS info). Sounds like your run-of-the-mill Floridian vacation spammer.